That beautiful rocking chair your grandfather made. Your classic hardwood floors. The butcher block surface you added to your kitchen. Wood is a lovely material with such grace and history. To keep it looking its best, you need to condition it, and you may need to refinish it. You have a few different options for a finish, but one type of finish suitable for a natural look is an oil. There isn’t a lot of shine, so it’s ideal for imperfect surfaces. It brings out the natural grain and prevents drying. We’ll take a glance at the best oils for wood. Plus, I’ve answered a few questions you may have about how to choose the right one. Let’s take a look. 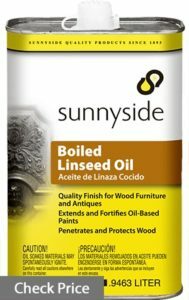 Linseed oil is a plain, classic wood oil that brings out the grain finish without changing the natural color of the wood. It’s used to strengthen the existing finish on your piece and prevent damage from over-drying and cracking. You can use it both for interior and exterior projects. Boiled Linseed oil has a faster drying time than raw. Sunnyside goes on uniform and dries in only 12 to 18 hours for a smooth, uniform finish. It repels water and prevents chalking. It’s safe to use on most furniture finishes and antiques. You won’t want to use this particular kind for any food preparations surfaces such as butcher block. The agents that speed drying aren’t safe for consumption. Make sure you read the label clearly before using. It’s excellent for conditioning dry wood including furniture and antiques. 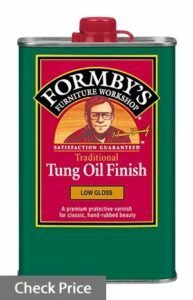 Tung Oil is another classic oil that protects the finish of the wood without hiding the natural grain. It resists both water and mildew and helps prevent chalking. It dries clear, so it’s safe to use as a complement. You should use it only for interior projects. Formby’s low gloss option gives the wood a hand-rubbed finish without highlighting imperfections. You can continue to condition your piece, working with the natural strength of the wood and finish. The glossier the surface, the more you highlight any scratches or dings. It comes in various sizes so that you can choose the right one that fits your need. Tung oil isn’t as glossy, so it’s perfect when you want a satiny finish, or if the wood has a lot of imperfections. 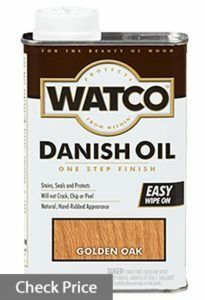 Watco Danish Oil is actually for interior wood with a varnish additive. It has the finishing properties of a true wood oil with the protective feature of a varnish. The Walnut color brings out a deep, warm tone to the wood. It’s easy to apply and penetrates deeply into the surface for a beautiful finish. You can safely use it on sanded, bare and stripped wood. It’s excellent with tight grained woods and surfaces with interesting grains because it can penetrate deeply without hiding the patterns. It’s not quite maintenance free because it doesn’t completely seal the wood. You’ll have to reapply it every so often to prevent the project from drying out. If you don’t want the color to get darker each time, I recommend a wax or a plain oil finish after the first round. 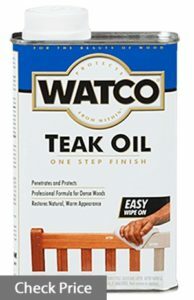 Watco’s Teak Oil Finish is suitable for more difficult woods such as teak, rosewood or mahogany. It penetrates deeply, protecting the surface from within without leaving a film or cracking later. It dries in just eight hours, making it great for quick projects. It’s water and UV resistant. It’s also suitable for marine use above the water line. It’s appropriate both for exterior and interior use. There is a bit of varnish in this oil to help further protect your hardwood from the elements. It may cause the color of your wood to darken over time if you reuse it to the condition. However, the initial color is warm and has the appearance of a hand-rubbed finish. It isn’t food safe, and you’ll need to make sure you allow any used rags to dry completely, so the fumes don’t cause spontaneous combustion. 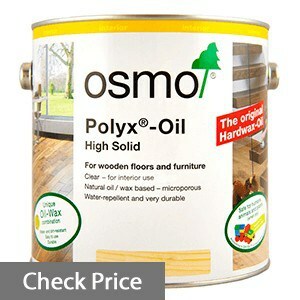 Osmo’s Polyx is a combination of different oils and waxes. It uses sunflower, thistle, and soybean oil as well as both Carnauba and Candelilla wax. This product applies a simple mineral spirit as a solvent. It has a lower odor than other, similar products. You can easily apply it, the coat will last a few years with proper care. Although it’s great for larger spaces like flooring and windows, it’s somewhat expensive. If you’re looking for a budget option, this isn’t going to be the right one for you. However, if you want something that will last a few years, this is a good option. It’s best for indoor floor finishes to condition your hardwoods and prevent damage from drying. 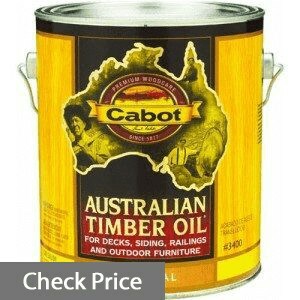 CabotStain’s option is a matte finish oil that penetrates deeply into the wood to protect it from within. You can control the sheen by adding a few more coats, but it never finishes as a high gloss. It’s a combination of Tung and Linseed oil. It’s going to take it a while to dry, but once it does, it’s UV and water resistant. You’ll need about two full days to get it completely dry with no tack so make sure you understand what you’re getting into. This one is strong enough to get through the grain. It’s solvent based so make sure you have plenty of ventilation. It’s excellent for both hardwoods and natural grain. 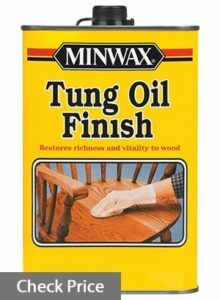 Minwax Tung Oil is perfect for pieces that are already finished and need reconditioning. It penetrates the wood deeply to prevent chalking and cracking. It’s water and mildew resistant and helps neutralize any acidity or alkalinity. Tung oil is easier to refinish than varnish, so it’s suitable for pieces you may want to rejuvenate after some time or that you might want to change later. It’s not pure Tung oil, but you should have a better result with the added solvent and varnish without having to refinish a piece completely. It dries more quickly than pure, classic tung oil so you can get layers without as much wait time. It uses a solvent, so make sure you have plenty of ventilation. This option helps to recondition the indoor wood completely, but you don’t want to use it near any food prep areas. 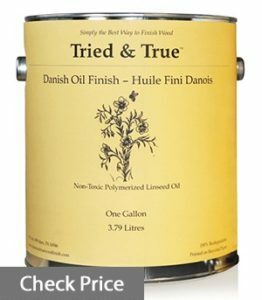 Danish oil is pure linseed oil that’s been moderately polymerized. It’s economical and produces a nice finish to your wood. It has better penetration than boiled one, but it may take longer to finish. There’s no varnish and no other additives. It conditions the surface, bringing out the natural grain and complementing the finish. You may have to reapply it periodically to prevent drying. It doesn’t have a color, and there’s no gloss. The sheen is suitable for wood with some imperfections. This option conditions and enhances the grain. It doesn’t have a toxic aroma like other finishes. It’s safe to use indoors and on food prep areas. It does have a faint cooking oil smell that some might find off-putting, but it fades after a while. This option doesn’t protect wood well, beyond just making sure there’s no cracking associated with drying out, but for indoor furniture and wood pieces, it’s beautiful. 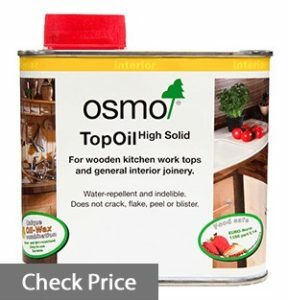 Osmo’s Top is an oil and wax mixture best suited for things like furniture and food prep surfaces. It conditions the wood, bringing back the shine. It’s water repellant. You can protect your food prep areas against staining agents like wine or things with a strong smell. It’s clear and dries with a satin finish. It resists scratching and helps you clean dirt and grime off easier. You can keep conditioning your wood piece without having to remove the top oil coat and without sanding things down. It’s easy to use, and it doesn’t add any color to your piece aside from deepening the color slightly due to conditioning. The biggest benefit is that this one is definitely food grade. 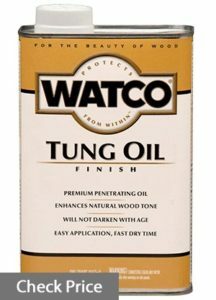 Our final product is Watco’s Tung oil. It’s not a true Tung oil, but it will dry a lot faster than traditional Tung oil thanks to a blend and drying ingredients. It takes about 24 hours, but after that, you’ll have a beautiful color with a beautiful deep grain. This option penetrates the grain of even hardwoods to condition and protect. It won’t darken with age, and it’s easy to apply. It doesn’t leave any tack the way pure Tung oil will. Watco does have a solvent, so make sure you use it in a well-ventilated area. It can be challenging to smooth excess because of the driers in the formula. Make sure you work with small areas a time to get the right amount of product in place. There are all kinds of finishes for wood, but how do you know which is the right one? Let’s go through a few things to consider before you choose. Different finishes are appropriate for different situations. Wax isn’t a finish by itself. Instead, it helps further condition wood and prevents the loss of color through drying and aging. It’s better to use in addition to another finish. 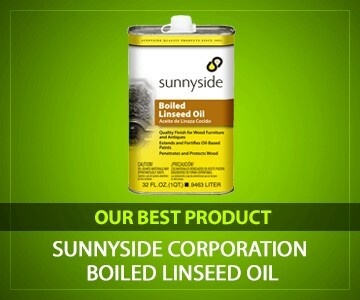 Most linseed oil used for wood finishing is boiled. Raw linseed oil just takes way too long to dry to be effective. Boiled linseed one goes on smoothly and dries to protect the wood. If you want true boiled linseed oil, look for “heat treated” or “polymerized.” All other types are actually chemical additives in raw linseed oil. They speed up drying time, but they can add a lot of toxic fumes to your workplace. Tung Oil is very similar to linseed oil. It takes a very long time to dry, so most wood finishes are either heat treated or have chemical additives to speed up drying time. It’s more moisture resistant than linseed oil. It’s penetrating, so it’s suitable for hardwoods that need more power to deal with their tight grain. Varnish has a bit of color to it. It’s a synthetic resin that penetrates wood and helps seal it. It cures by the same process (polymerization: the act of drying into a solid state), but it’s more durable than oil. If your main purpose is to seal wood surface to protect it from moisture then sealer would be a more appropriate option for you. These have the best of both worlds. The oil helps the application and conditions the wood while the varnish enhances the color and increases durability. They’re far more water and weather resistant. Plus, some of the finishes are UV resistant. Other types of high shine finishes include things like shellac and lacquers. These create a layer of material on the surface that’s very reflective. For perfect woods, these can also enhance the grain. They aren’t suitable for woods with surface imperfections because the gloss makes imperfections a lot more obvious. They’re known as surface finishes because they dry on top of the wood instead of inside it, creating their signature shine. You’ve decided that oil is a good finish, and lucky for you, it’s one of the easiest to apply. The first thing you should do is identify the type of wood you’re working with. Really porous woods may not do well with oil because the wood soaks it all up leaving very little on the surface. Getting an even coat is difficult. Once you’ve identified your wood, sand the surface gently to remove any dirt or grime before you apply the oil. Work from coarse sandpaper to fine to ensure you won’t have any deep scratches left on the surface of the wood. Apply the oil gently with a high-quality rag. Lower quality rags can pill and leave those annoying little pieces of fuzz everywhere. Wipe up the excess and make sure to clean your clothes carefully. Allow the proper amount of time to dry before adding a second coat. The drying time will depend on the product you’re using. Be sure to read the instructions thoroughly. Any oil with a solvent has the potential to be a fire hazard. Most experts recommend submerging the rag into a bucket of water with an airtight lid, but very few people actually do that. You should make sure the cloth is flat and can dry completely. If you bunch the rag up after using it, escaping fumes turn up the heat and are in danger of combusting. You may find yourself walking into a fire hazard. 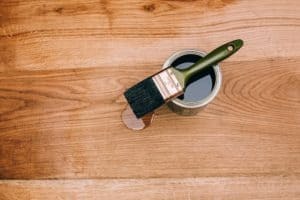 Oils should never puddle on your wood surface. Make sure you’ve correctly wiped the excess away before allowing it to dry. Options that contain solvents will need more than just water to remove. You’ll need a paint thinner or other removal agent. What Are Some Safety Procedures? Oils can be harsh on the skin. If your product also has a solvent added to help with the application, you may need to wear gloves and eyewear. The biggest safety concern is ventilation. Fumes from the oil or varnish blend can cause severe respiratory issues and danger to your eyes and brain. If you can’t ventilate the area, you should consider an alternative to the product you’ve chosen. Never leave oils around where children or pets can find them. Also, if you’re conditioning something in your food prep areas, make sure your oil is specifically labeled as food safe. Otherwise, you risk ingesting toxins. Pure oils can be a bigger investment than oil blends. Some of the products on our list are well within most budgets and can be used again and again. More expensive options include oil and wax blends with ultra-conditioning properties. You can justify the expense because you won’t need to apply them very often. If you have large areas, you may be able to save by buying in bulk. Otherwise, you can use a more expensive product on woods such as antiques or delicate finished woods. I would never discourage you from trying to save money, but sometimes you get what you pay for. If your product protects your wood and prevents damage from drying and aging, it’s worth it to spend just a little bit more. You save yourself from spending a lot more on significant repairs. 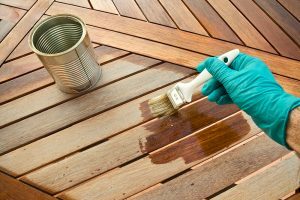 Wood oils can prolong the life of your wood piece and help prevent repairs. Choosing the right option brings out the wonderful grain quality in the surface and helps keep the structure of the wood intact. A project may dry over time or change shades, but a good quality oil can breathe new life into it.